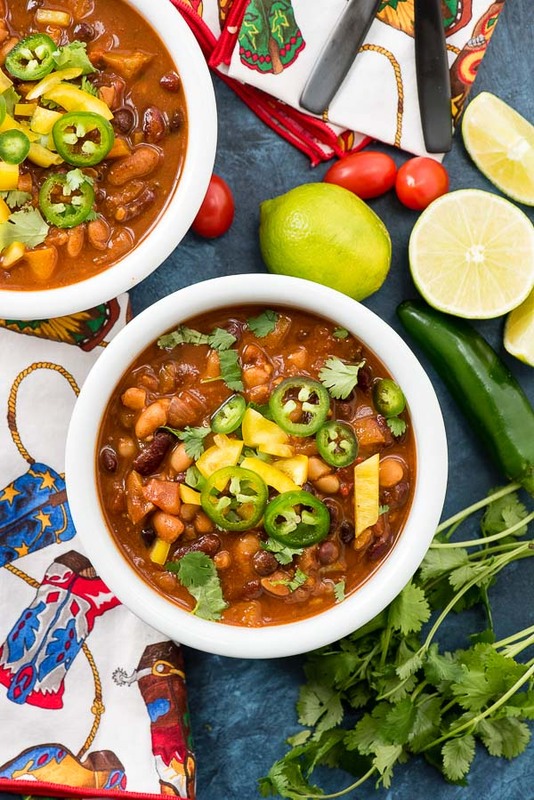 The Vegan Instant Pot Recipe: 4 Bean Chili is packed with big flavors and plant protein in a creamy tomato broth. This 4 Bean Chili is a 30-minute, hearty dinner recipe requiring about 4 minutes active cooking from you! And you’ll never miss the meat! Usually when January hits I naturally want to improve my eating habits. I max out on rich foods, cocktails, and an increase of desserts to what I normally eat. So, I wouldn’t say I have a resolution to do it but more that my system goes into rebellion craving healthier options, which is why this vegan instant pot recipe is perfect. 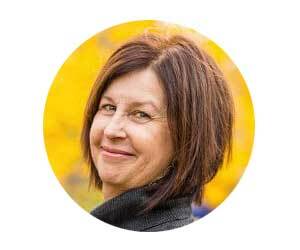 At the risk of sounding like an Instant Pot fanatic this week, I have grown to rely on it almost daily for everything from dinner, large pots of soups to get ahead, to making boiled chicken for a homemade treat for our puppy. It’s just so darn easy. 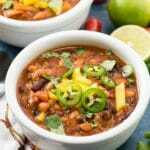 As mentioned when I shared the Instant Pot Chicken Taco Soup recipe, the Instant Pot really delivers building great flavor with recipes like soups and stews. They taste like they’ve been simmering on the stove for hours when they have only cooked for minutes. Can’t beat that, right? For those without an Instant Pot you’ll find some great recipes at the bottom of the post! In winter I love chunkier stews, soups and chilis. The texture goes a long way to fill hungry stomachs and warm them too. 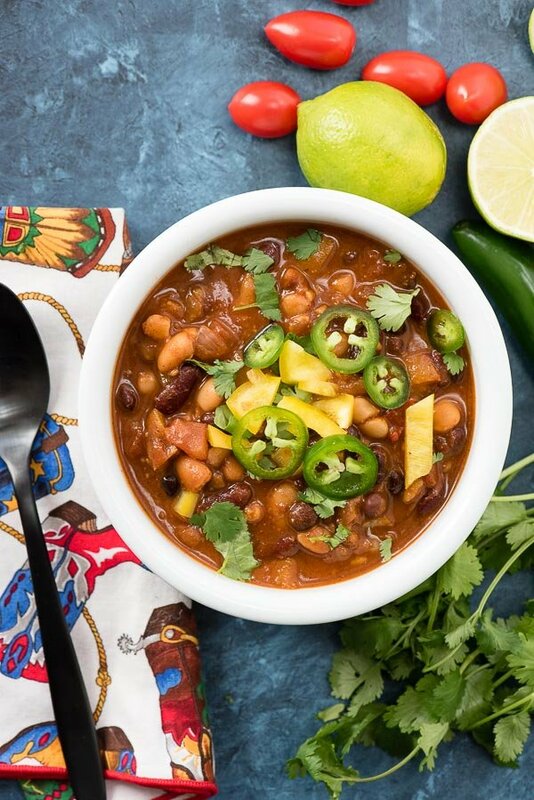 This 4 Bean Chili Vegan Instant Pot Recipe uses four of my favorite beans: black beans, red kidney beans, cannellini beans and great northern beans. The combination of the different size and color beans makes for an varied texture and great flavor. Did you know beans are packed with protein, fiber, antioxidants and B vitamins? They are a very affordable source of plant protein so a great choice for those ‘meatless Mondays’ recipes. 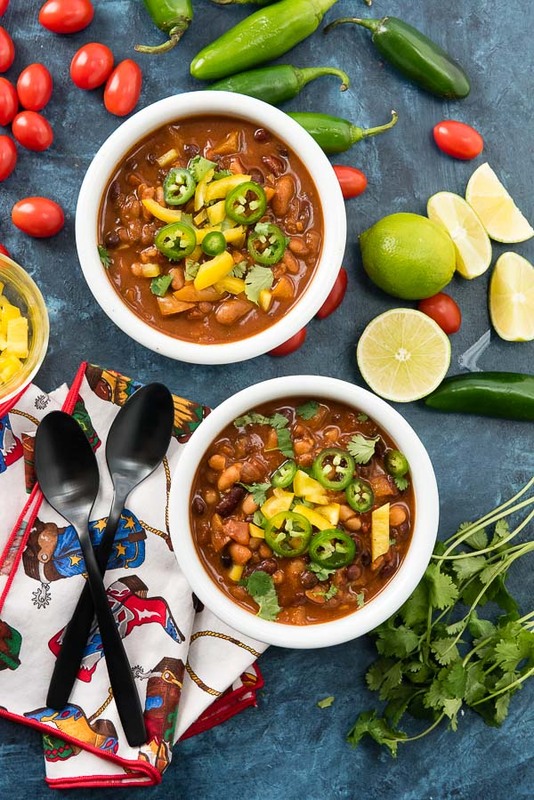 This Vegan Instant Pot Recipe: 4 Bean Chili is so hearty you won’t miss the meat, promise. My Secret Tip for Wrangling the Bean Aftermath: many people avoid beans due to the digestive distress they experience. My tip is to add a strip of Kombu Seaweed, a dried seaweed available in the Asian section most grocery stores or online, to bean recipes. It adds some subtle flavor (not a seaweed’y flavor) but most importantly contains enzymes that break down the sugars in beans which is what causes the digestive turmoil for those who get it. Remove the seaweed before serving the recipe. One thing I love about using the Instant Pot for this recipe is being able to cook the entire recipe from sauté to pressure cook leaving only the insert for clean-up versus multiple pans. Don’t let the length of the ingredient list scare you. Most of the ingredients are spices or canned so you can still prep everything in less than 10 minutes. The onions and peppers are sautéed in the Instant Pot with the garlic added in too. The remaining spices, vegetable stock, tomato sauce, tomatoes and beans are added in and cooked on high pressure. 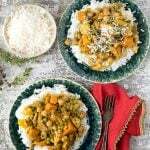 The result is a flavor-packed recipe with a creamy consistency broth from the tomato sauce. 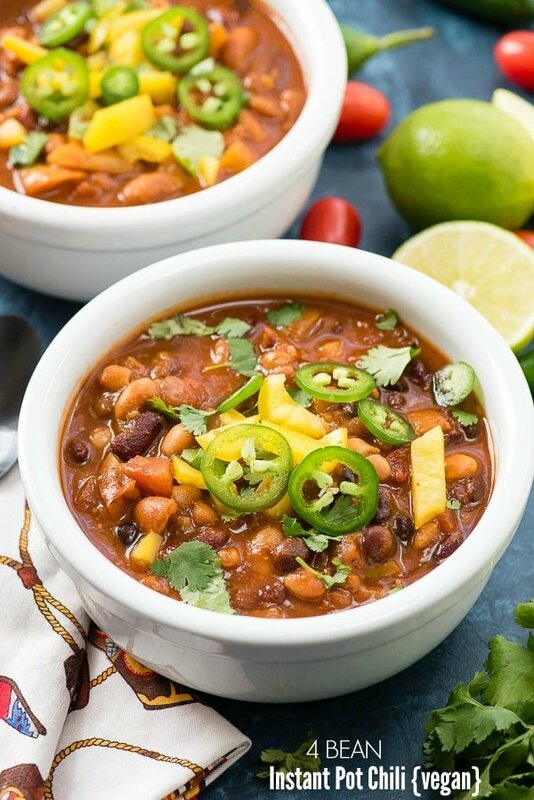 This easy Instant Pot 4 Bean Chili is simple to assemble and quick pressure cooking creates bold flavors with a creamy texture to the broth. 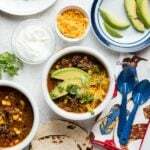 Naturally vegan, it makes a great protein-packed meatfree entree or can be loaded with toppings like grated cheese, sour cream, cilantro and avocado slices. Select the SAUTE function on the Instant Pot. Heat the oil and add the onion, peppers and garlic. Saute until onion starts to soften (3-4 minutes). Add the chili powder, cumin and oregano; saute for an additional minute. Add the remaining ingredients, secure the lid, set the vent on SEALING and select MANUAL, High Pressure for 10 minutes. When complete, do a Natural Release for 10 minutes then release the remaining pressure manually, stir and serve. Garnish as desired. I love this recipe!! I’ve made it a million times for a few different nonvegan people and they ALWAYS love it! This is definitely a home run! I make it using whatever beans I have on hand. Tonight is a mix of light and dark kidney and pinto. Love it!! Also, I don’t have the chipotle/adobo so I’ve added a couple Serrano chiles for heat. I love that it’s so easy to make substitutions depending on what you have on hand. Thanks so much for this simple and delicious recipe! I’m so happy to get your comment Holly! I agree on it not translating as a ‘vegan’ recipe to non-vegans too. So hearty with big flavors for everyone!! Nutrition states 33 calories per cup. I sense this is a typo ? Wonderful flavors and so warming !! Thank you Andrea! The nutritional values are derived with a auto calculator pulling values from a large database of ingredients. I went in after seeing your comment and it was pulling values for ‘1’ can of ingredient vs 15-ounces. It has been updated. Thanks much for your time and comment! 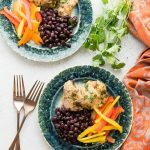 Hi, can this recipe be made with dry, unsoaked beans instead of canned? If so, would I need to increase the time? Thanks! I’ve only made the recipe as noted Kim. If you wanted to use dried beans instead I believe you’d have to make it a two part process; cooking the dried beans first in the Instant Pot and then compiling them with the chili ingredients to cook the chili. We tried your Instant Pot Chicken Taco Soup this week and are BIG fans! Full of warming flavors and low carbs, it was a hit. Please keep these Instant Pot recipes coming!! This sounds amazing! I love finding new recipes for my Instant Pot. This is a great one for those cold nights we are having. Delish! I love the added heat- I am a big fan of spice, especially in this cold weather! 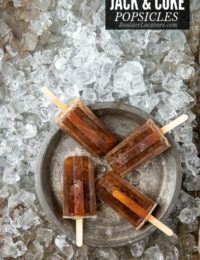 This is a really awesome recipe! I love how healthy and tasty it is! This looks delicious. 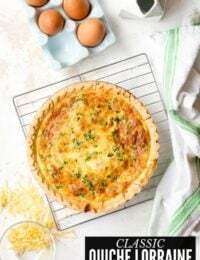 I’m going to add this to my list of recipes to try and make a batch of it for the family. 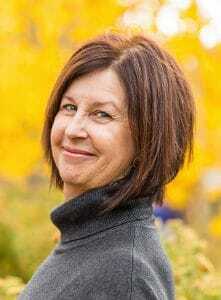 I am always looking for new vegan recipes to try. I got an Instant Pot before the Holidays and it is amazing. I will have to give this a try on the weekend. I love chili, but I always make it in my crockpot. 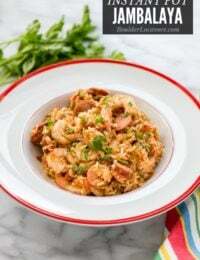 I need to try making it in the instant pot and see how I like it. I love cooking using my instant pot as well because it makes cooking easier especially when you also have a house to take care of. 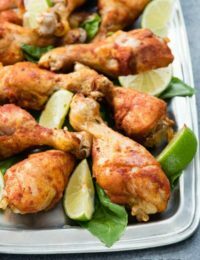 I think this recipe will be enjoyed by my boys very much! Thanks for the tip on the Kombu seaweed! I’ve never heard of it but it’s perfect when you’re having beans as one of the ingredients in your meal. This chili recipe looks SO good. I love cooking with the Instant Pot! I was very nervous before I first got it, now I used it all the time, sometimes 3-5 times per week. I’d never heard of the seaweed tip! What a great idea! can’t wait to try this chili recipe in my IP. Well this is certainly the perfect cold day dinner idea to make up. 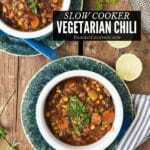 I will give your 4 bean instant pot chili vegan recipe a try 🙂 Seems easy enough! I am adding this to my menu plan. I do have an Instant Pot and I am in the process of learning to use it like a pro. Thanks for this vegan chili recipe. It looks so delicious and healthy too! My husband and son are such chili eaters! In fact, it’s often the only way I can get them to eat beans and veggies. This recipe sounds delicious! We just made something extremely similar the other night, I have fallen in love with my insta-pot. 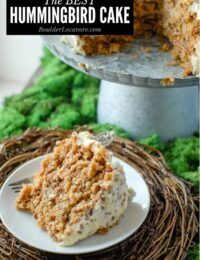 I am sure many who received one for the holidays will love this recipe. I feel the same Jenna. I was a bit afraid of it at first, lol, not sure if I could mess something up. But now I totally relay on it for fast flavorful meal options. I think it’s particularly good with soups and chilis. Makes them super fast and really creates flavor that tastes like it’s been simmering for hours on the stove, would you agree? That looks so good! These are the kinds of vegan recipes that I love. 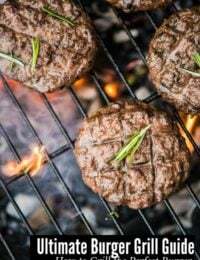 They are flavorful, filling, and full of protein. This looks amazing! I am so craving this. Especially with the cold weather, this would hit the spot.